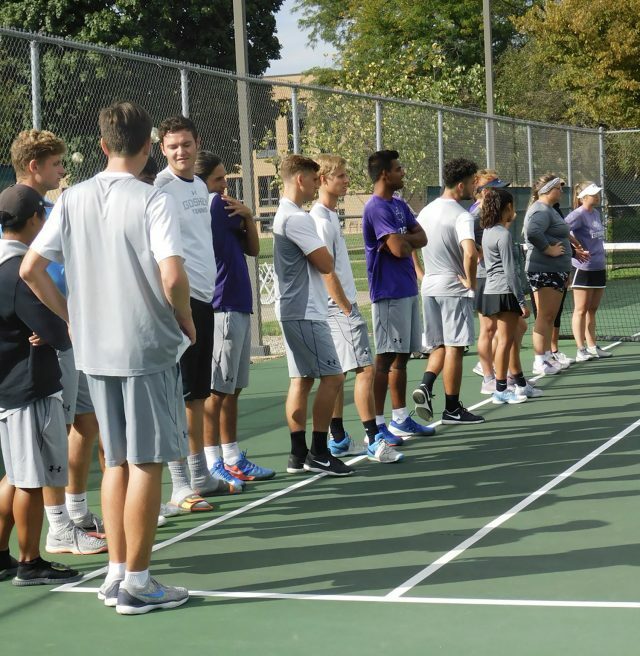 The Goshen College men’s tennis team has advanced to the semifinals of the Crossroads League tournament after beating Grace College 6-3 this past Tuesday. Josh Friesen and Luke Rush gave Goshen an early 1-0 lead by winning their doubles match 8-4. But the Lancers responded by leveling the score to 1-1 with an 8-3 win. Martim Cafe and Danny Boussom stepped onto the court and were able to regain the lead with an 8-3 win of their own. After Goshen took the lead in the doubles contest, the focus shifted to the single contests. Friesen, Evan Beck and Kartikeya Sharma all won their opening sets whilst Grace’s Pavel Popovic took an early lead against Juan Miguel Ciudad, winning the set 6-2. Grace’s Max Rozas won his first set against Boussom at the same time that Beck’s opponent, Lucas Fonseca was able to level his match by taking the second set 6-4. As Grace attempted to make the comeback, the Lancers’ Jacob Gray took the lead against Friesen in the second set 4-3. Whilst this occurred, Cafe won his opening set 6-2 for the Maple Leafs. Friesen was then able to regain control from Gray taking the set 7-5 to win the game. As this occurred, Ciudad won the second set of his match to draw the game level. Sharma and Rozas then went on to win their games in straight-sets. Goshen needed just one more win to claim their place in the semifinals. It was Cafe who was able to secure the place by repeating the same score from his first set 6-2. With Goshen claiming the victory, Ciudad and Popovic went to a third set. The 10-point tiebreaker saw Ciudad take the victory. The Lancers’ Lucas Fonseca rounded up the contest by winning his matchup in the No. 6 singles. Goshen will now travel to second-seeded Marian on Thursday for the semifinals. Up Next: Thursday, Oct. 4 — Goshen at Marian (Crossroads League tournament semifinal), time to be announced.